Green Gourmet hard-anodized pans feature an aluminum alloy core and exclusive nonstick surface that's ceramic- rather than petroleum-based, so it helps to conserve existing oil reserves. Handles are made from 70% recycled stainless-steel and Green Gourmet conducts heat so well, it's more energy-efficient too. Even the manufacturing process uses less energy than others. No conscientious cook should be without it. I've had this skillet for a month now and I'm glad I bought it. For a first generation product, it's acceptable. Cons: not dishwasher safe, the manufacturer recommends hanging the pan because the ceramic is prone to chipping and the heat distribution needs to be improved. Outstanding close to perfect skillet. 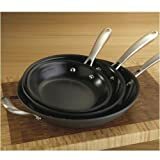 Cuisinart GG22-24 Green Gourmet Hard Anodized Eco Friendly Nonstick Cookware 10 inch Open Skillet is the best I have ever used. The nonstick is great. Eggs don't stick, the heat is perfectly even and clean up is magic. I've bought three brands so far. First I bought a Green Pan saute pan on HSN, then Wolfgang Puck (which were also at HSN but have apparently been pulled off the market). The Green Pans were a disaster from about the second or third use. Oil hardening against the sides, and then on the bottom. Nonstick finish and then external lacquer chipping. I sent them back and ordered the WF two-pan set. I thought the WF set was a little more substantial. I've been using the WF Bistro collection of stainless steel cookware for years, and it's performance has been spectacular. So maybe I had rose-colored glasses on intially. Over time, it did the same thing as the Green Pans. Oil burned into the sides and then the non-stick began to chip. I just threw the first one away, and the second is not far behind. The Cuisinart, which I bought in between the two orders, has held up really well over about six months. I handwash it and use only nylon utensils. I've had no oil build-up and the nonstick quality has endured. It's a nice weight and distributes heat perfectly. I just wish I had a cover for it, but the Bistro covers fit well enough. The best non-stick pan I have ever used! I have never used a pan this good. The surface is non-toxic so can be safely used at high temperatures. It emits no odd odors as petroleum-base coated pans do. This pan has changed the way I can cook, it's like a door just opened. I use oil as I wish to for flavor, not because I have to. And I really don't have to. It is a plus to be oven safe. The extra handle is good to have but not necessary. This pan is not overly-heavy, my stainless steel pan is much heavier. I highly recommend this pan, it is worth the price. I've just purchased the 10" and may even get more. It is the only pan I want to use.